Eminem surprised music fans across the world last Friday when he delivered his ninth studio album Kamikaze. At this point in his career, Marshall Mathers needs no introduction. He is the best selling rapper of all time and he has established himself into one of the best lyricists and MCs to ever grip a mic. His meteoric rise to the top, in which he dropped classic album after classic album, set the bar for the next generation of rappers. Despite the laundry list of accomplishments that Em has achieved, the past decade has not fared well for the Detroit superstar. After a series of three albums that received somewhat mixed reviews, Eminem released his eighth studio album, Revival. Critics and fans alike were appalled by what was concocted, ranting furiously that this project was the worst in his discography. 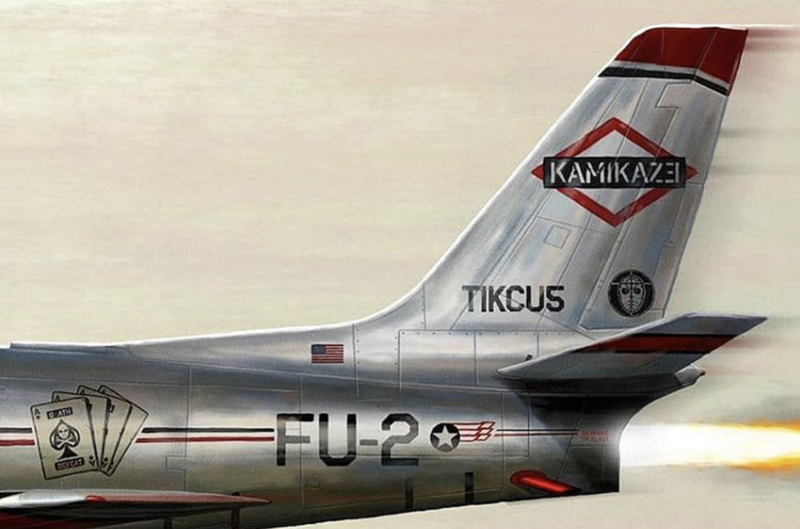 Kamikaze’s rollout is one that we have never seen before from the man known as Slim Shady. For starters, as previously mentioned, this album hit streaming services out of the blue Friday morning, unlike Revival, which had months of buildup. It is also worth mentioning that the time span between Revival and Kamikaze is the shortest period between albums in Eminem’s career. The reasoning for the quick release of Kamikaze is due to how poorly received his last album was and he made that clear in the very first track “The Ringer.” While Eminem’s flows on the song are somewhat high quality, it mostly sounds like a childish rant about why his most recent set of songs wasn’t popular among listeners. His excuses are laughable, citing music pages only gave negative reviews for click-bait and people didn’t listen because it was auto-tuned. Speaking of auto-tune, Em goes after anyone and anything trendy on the 13 songs in the tracklisting. There are many current rappers that Eminem attacks lyrically such as calling Lil Pump and Lil Xan mere Lil Wayne knockoffs on the opener and going in on Machine Gun Kelly for comments he made a few years ago in regards to his then-teenage daughter on “Not Alike”. These bars have elicited responses from the parties involved, as Lil Pump said he “deserved that” on an Instagram comment and MGK responded with a diss track of his own. However, the most talked about diss is also the most tasteless one on the record, which comes on the song “Fall”. In a set of lines, Eminem attacks Tyler, The Creator, by using a homophobic slur, which is uncalled for due to speculations about Tyler’s sexuality following the release of 2017’s Flower Boy and is generally uncalled for in any context. Eminem’s hook and singing game have not improved much either. On the second cut “Greatest”, Mathers delivers one of the corniest hooks on the album in a weird sing-song fashion. He also delivers an excruciating third verse on the song “Stepping Stone”, which goes toe-to-toe with any of the awful flows on Revival. I have many criticisms of this album, but there are also a couple of high points that I really enjoy. Any hook that is not delivered by Eminem comes out decent or good. Joyner Lucas sounds hungry and energetic for his chorus on “Lucky You”, Jessie Reyez delivers two solid efforts on the sister tracks “Nice Guy” and “Good Guy”, and the Justin Vernon spot on “Fall” goes off without a hitch (so long as you don’t mention that Vernon didn’t approve it). “Lucky You” is my favorite track off this LP not only because of the quality verses dropped by both Eminem and Joyner Lucas, but because of how good of a conceptual song it is. The Joyner part of the track is delivered from his point of view as an underdog who is under recognized and under appreciated and the Em verse comes from a place of a man who has done it all, but feels he has compromised in order to reach the top. Having these to counterpoints makes for a compelling listen, and it doesn’t hurt that the instrumental is low-key banger beat that eases up towards the second half. Eminem did clear the very low bar that was set for him on Revival, but he barely made it over. He is showing signs of an aging and out of touch lyricist who will resort to name calling and dropping in order to maintain relevance. Slim Shady is nearing the end of his time in the limelight, and has shown over his last two projects.